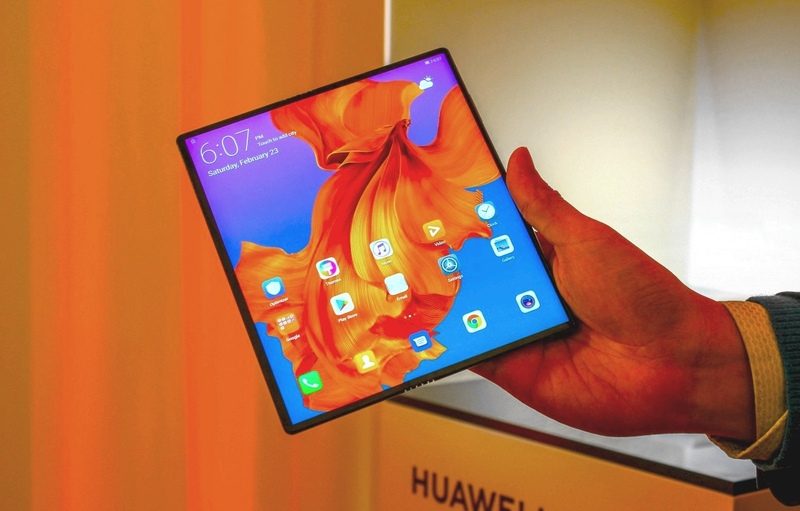 Forward-looking: Huawei is making a splash at this year's MWC by debuting its own foldable phone that the company says is 5G ready. The Mate X is set to rival Samsung's Galaxy Fold, as the kind of unattainable, expensive, and for the time being, hands-off device that is all about showing off. Huawei's first-generation take on the foldable phone however looks more polished and usable than Samsung's $2,000 offering. When folded the Huawei Mate X looks like a "normal" phone that has two screens, front and rear. Open it up, and it looks like a razor-thin 8-inch tablet with narrow bezels on three of its sides that begs to be used for watching video and taking full advantage of the larger footprint. Seen in action it makes complete sense a foldable phone should work like this. The Mate X is packing two screens. A main 6.6-inch display and a secondary 6.4-inch one on the back. When unfolded, the Mate X turns into a 8-inch panel (8:7.1, 2480 x 2200 resolution) that is only 5.4mm thick. Folded the phone measures in at 11mm, which is considerably better than the Fold's 17mm, but is still a tad bigger than current flagships like the iPhone XS (7.7 mm) and Galaxy S10 (7.8 mm). On the spec sheet side, the Mate X is powered by Huawei's own Kirin 980 SoC, 8GB of RAM and comes with 512GB of internal storage. A 4,500mAh battery and 5G connectivity are standard, the latter provided by a modem developed in-house called Baolong 5000 that the company says is faster than Qualcomm's alternative. The device will also have 55W SuperCharge, with claims that the Mate X can charge up to 85% of its battery in 30 minutes. There is no in-screen fingerprint reader on the Mate X, instead it relies on the power button that resides on the narrow bar on the right/back that also houses three Leica cameras. So far all foldable phone implementations have looked clunky or at best alpha-stage. In fact, people were surprised when Samsung announced they planned to sell the Fold -- though few are expected to buy the thing -- it could be Samsung's way to say their hardware and software is production-ready, even if comes at the cost of user friendliness and usability. But Huawei is also expecting to sell the Mate X mid-2019 for nothing less than €2,299. It should be noted than neither the Mate X nor the Galaxy Fold have been made accessible to the press to actually touch, use and get a feeling of the phones. The folding action and software support on both look very natural, which is great, but in real usage scenarios, we wonder if there are major drawbacks to the display section that is behind the hinge. When looked at directly with a bright image on display, the screens look flawless, but at an angle, with light hitting the display you can clearly observe weird refractions that could compromise usability, but that remains to be seen.